A visionary band born in the streets of Stockholm. Playing improvised house, hip hop, afro-beat, jazz and balkan on Bicycles, Baritone sax and Alto sax. Filled with energy and heart. It all started the summer 2014, when the two musicians Johan and Mårten met through a mutual friend and got a spontaneous idea – lets leave our rehearsal studios and late club gigs for a while and try something different. Lets get out in the streets and just jam! With a baritone sax and a mini drumkit, they took place at Drottninggatan in Stockholm and started grooving, all improvised stuff. In the capital of commerce, competition and hipsters, the streets were pretty empty of creativity and the duo realised how much people appreciated something fun, colourful and groovy on their way home from work. So they kept on going, and made a living from playing through rainy autumndays and icy winter, developing their own sound of funky beats, hits and avant garde jazz. As the spring came, the band got their name when a small mistake led to a brilliant idea. One day as they met at their usual spot, Mårten realised he had forgotten some parts of his drums and couldnt get his kit together. Oh blast! Suddenly Johan was struck with an insight. “Hey, lets use my bicycle instead”. Half sceptical, half delighted, Mårten started banging the bike, Johan tapped in with his baritone, they got the grooove going, and the crowd around them started to grow until the whole street was totally blocked! The police had to stop the session to let people trough. People loved it, the coins were flowing in, videos spread over the globe and people came up and asked if they were available to play at their parties. There was no doubt this band would do some great things. In spring 2016, the amazing alto saxophonist Björn went on Drottninggatan, really enjoying what he saw and heard. He brought up his golden companion from its case and blew a hypnotic solo. After the song, people applaused enthusiastically. The old duo looked at each other and smiled, realizing they had just found their third member. From this on, Bicycle Beat was a trio, and started building a repertoire of their own compositions blended with favorite hits and improvisation. 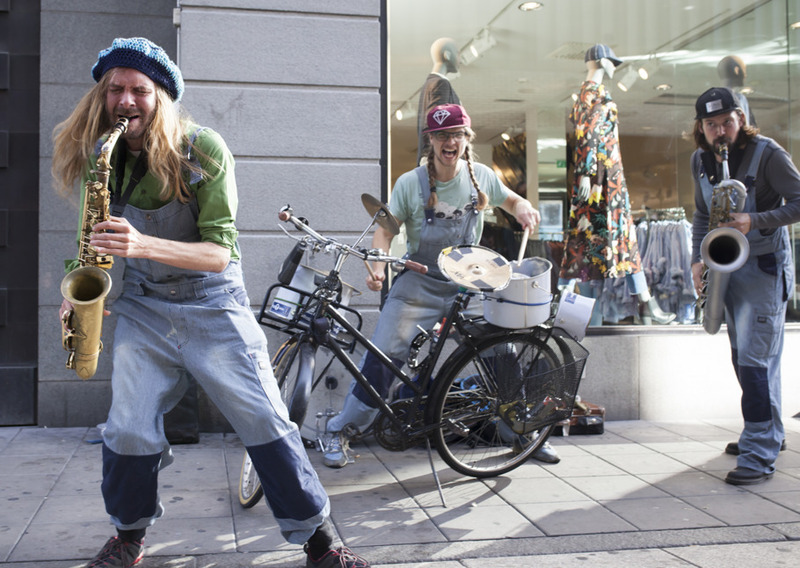 Since then, Bicycle Beat has made several tours in the nordics and Scandinavia, and played at streets, weddings, birthday parties, festivals, clubs, conferences, demonstrations, group trainings, open ceremonies for things like bike lanes and public transit, art exhibitions and and oil companies... no just kidding! The band recorded their first album, "Bikers", at Nataraj Studios, recorded in live sessions. The album was released at Scalateatern the 20 May 2017. Same year the band got funding from Statens Musikverk to do a big project in schools about music and the environment, called Music for the Planet, with concerts and workshops about visions and dreams for the future, in twenty schools. They wrote new songs out of the visions the youth expressed, in collaboration with the duo Superkrafter, which was released and recorded at the club Stallet in Stockholm, the 27 April 2018. In november 2018 the band went into studio for their second album, this time with guest artists, due to be released in spring 2019. Since the start, this band has had a moral driving force: to be the change we want to see. Sharing the contributions from the streets with brothers and sisters in need and supporting initiatives towards a environmental and social transition towards a more humane society and a planet we proudly can leave to our children. Welcome to contact us for any event were you want people to smile, play, dance and create great things together. And lastly: thank you all for the energy and love that make us keep on going. We believe in big visions, and in people following their heart. If you follow yours, we promise to keep following ours. See you in the streets! To inspire, lifte and connect humanity with funky grooves, raw energy a lots of fun. We always give away 10% of the tip from our street gigs to people in greater need. We practice circular thinking by using trash as instruments. We use bicycles and trains as our common means of transportation. On our rider is vegan food.